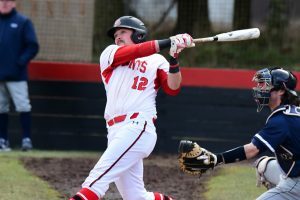 Saint Martin’s University baseball coach Kelly Gau believes Austin Feist possesses the ability to take over a series. Feist entered his final season in Lacey a career .302 hitter and well on his way to 200 lifetime hits in a Saints uniform – a feat that would place him in a select fraternity. Last year the outfielder broke through, earning first team all-Great Northwest Athletic Conference honors after hitting .320 with a team-leading six home runs and 30 RBI while appearing in all 48 contests. The distinction came following back-to-back honorable mention nods his first two seasons at SMU. 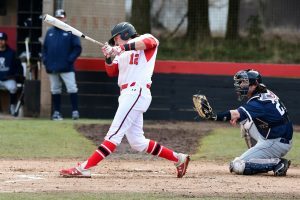 An unusually cold start to the year at the plate, Feist impressively broke out of his slump, going 3 for 4 with a two-run homer during the Saints’ recent 10-0 drubbing of Western Oregon University. The win over the Wolves was the 11th on the season for Saint Martin’s, matching last year’s seasonal win total, and inching the team closer to posting its first winning season since 2011. A run-scoring single in the second game on March 31 against Western Oregon, gave Feist his 100th career RBI. He became just the fourth player in program history to break the century mark for runs batted in, joining Chandler Tracy (138 RBI, 2012-15), Adam Siler (118, 2014-17), and Shane Schoeneberg (110, 2005-09). With 20 games remaining, Feist is on pace to set the program record for most games started in a career. The benchmark is currently held by Schoeneberg, who started 185 games between 2005 and 2009. Should Feist not miss a start the rest of the regular season, he will finish with record-setting 189. And it certainly has for Feist, who could find himself all over the Saint Martin’s record book by season’s end. He currently sits fourth in career runs scored with 97, fourth in doubles with 38, fourth in home runs with 13, and sixth in hits with 169 as he looks to join Schoeneberg (222) and Tracy (203) in the 200-career hit club. In addition to his on-the-field accolades, Feist is also seeking to become a three-time GNAC All-Academic performer this season. 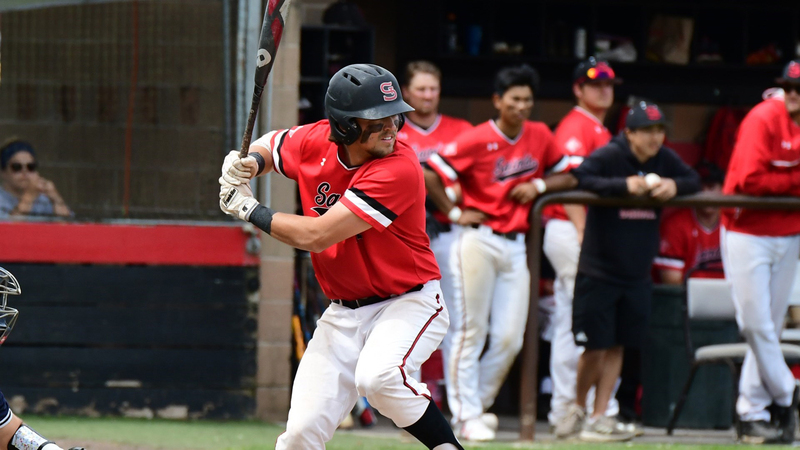 The Saints’ baseball team will host Central Washington University in a four-game series April 13 and 14 before closing out their regular season home slate with four games against visiting Western Oregon University, May 4-5. Saturday games in both series will be played at 1:00 and 4:00 p.m., while Sunday contests will take place at noon and 3:00 p.m. The GNAC Tournament will be held May 8-10 in Portland, Oregon.